"Our bodies are aware of the things that our minds would like to push aside. The things that we have forgotten at a conscious level are still present all the time in our bodies. The good news is that it’s never too late to address these issues, and that the results can help with both physical and emotional pain." "Find a daily physical practice you enjoy. Notice I didn’t say “exercise.” Caring about our health and fitness is important, but the intention here is a physical activity that we love. It helps to choose an activity that quiets your mind a bit. For me, this is yoga. Many people find running to have a meditative quality. It could be as simple as a ten minute quiet walk where you pay attention to your breathing and the sensations in your body." "Receive regular bodywork. 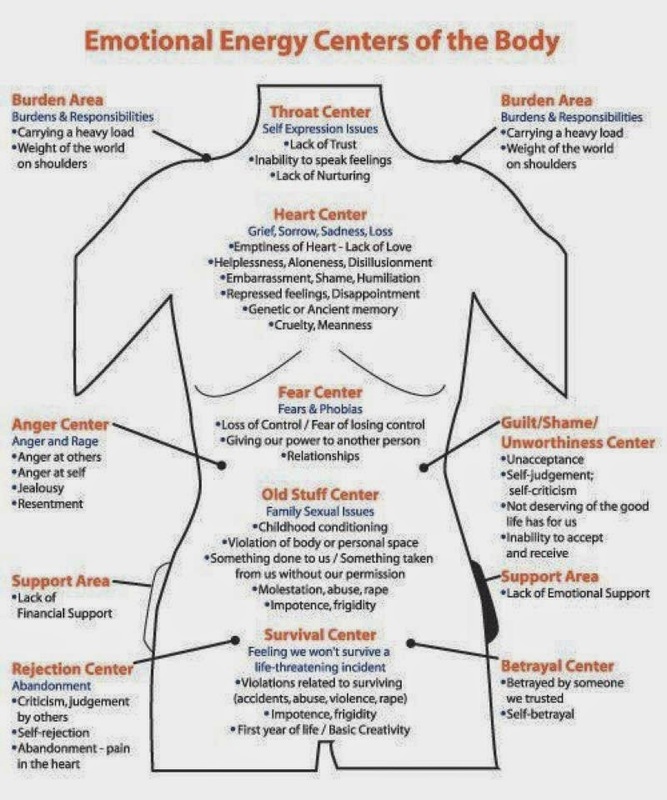 Therapeutic massage and bodywork are some of the most effective ways I’ve seen (and experienced) for releasing stored emotion. When someone works on those knots in your shoulders you have from long held anger or stress, sometimes emotions will come up. I’ve had clients cry on my table—and sometimes they’ve known and shared why; other times, the pain is old and just hanging on in the muscles, waiting to be released. It’s important to remember that a massage therapist is a facilitator for these things—not a psychotherapist. Through bodywork, we can tap into these stored emotions and begin to process them ourselves, or if needed, with another professional." "Make touch a part of your primary relationships. This sounds simple, obvious even. Unfortunately, we have become a very hands-off culture. Fewer and fewer of our daily interactions involve touch. As we rely on social media and smart phones for the bulk of our communication, our relationships often involve less physical contact than we need. Make a point of touching people on the arm or shoulder as you speak with them. Greet friends with a hug. Play a pick-up game of basketball instead of just watching the game. When we begin to remember that we are not just minds stuck inside a body, but body and mind working in concert, we can begin to heal old hurts in a deeper and lasting way."